With his gelatinous structure as his only means of defense, Gish must follow the echoing cries of his damsel in distress deep into the earth below. What freakish creatures dwell in this subterranean land? Who is Brea's captor? And just how far down does the rabbit hole go? Give Gish as a gift for download! 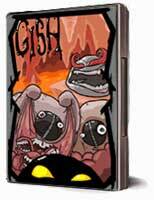 Immediately after ordering Gish you will be sent a keycode and download instructions. Read more! Multi platform support: Gish supports Windows, Mac OS X and Linux: Buy once, and you can download and run the game on any of these systems!